Proprietary Name: Rite Aid Brilliant White What is the Proprietary Name? Non-Proprietary Name: Sodium Monoflourophosphate What is the Non-Proprietary Name? 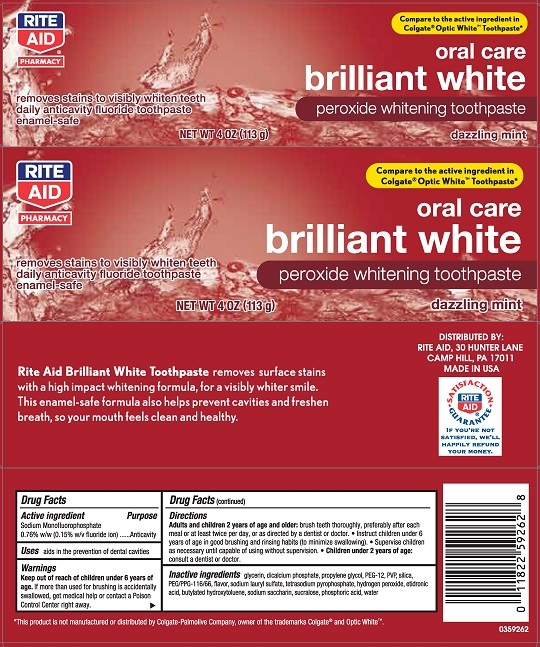 Rite Aid Brilliant White with NDC 11822-6032 is a a human over the counter drug product labeled by Rite Aid. The generic name of Rite Aid Brilliant White is sodium monoflourophosphate. The product's dosage form is paste, dentifrice and is administered via dental form. DirectionsAdults and children 2 years of age and older: brush teeth thorughly preferably after each meal or at least twice per day, or as directed by a dentist or doctor.